I share my style with you because I like to. I share my style with you to inspire you. But I do not want you to run to the store and buy exactly what I'm wearing. Most likely, you already have something similar in your closet that you can use to replicate the look and you won't have to buy anything. Or, maybe you just need to buy one piece; like a long cardigan. That's what I usually do when I see a look I like! And finally, I share my style with you because I like to show you how I can wear the same pieces over and over again in different ways so I get a lot of use out of them. I always link back to previous posts when I show my older clothes. Now why did I share all this information? Because somewhere along the line style blogging has drifted from sharing our individual style to making money through links. I was just stunned reading another blog post the other day. The blogger was all upset because she purchased a top at a brick and mortar store without making sure it was available on-line first. Then she considered herself a bad fashion blogger because she couldn't provide a link. I thought, "Really? One is a bad fashion blogger if they are not wearing something new all the time? I mean, when is enough enough? How many clothes do we need anyway?" In the three years I have been reading fashion blogs, I think I've only made two exact purchases because I saw someone else wearing it. I usually just get inspired by a picture, and find something in my own closet to create my own look, or find a similar item at a store in my price range. If I am wearing something new and provide a link, it is only out of courtesy for the reader, because some readers want to know where I got it. That's it. That being said, here are the details of what I'm wearing today. This is the outfit I wore to meet my husband for lunch and shopping. Except, I never ended up wearing the sweater but kept it in my car because it was seventy eight degrees that day. The hat is a brown felt hat with a cute braided trim. I picked it up on clearance at Forever 21. The long cardigan was bought last year from JCP. I previously wore HERE, HERE, and HERE. The dress I picked up on clearance at Charming Charlie's. 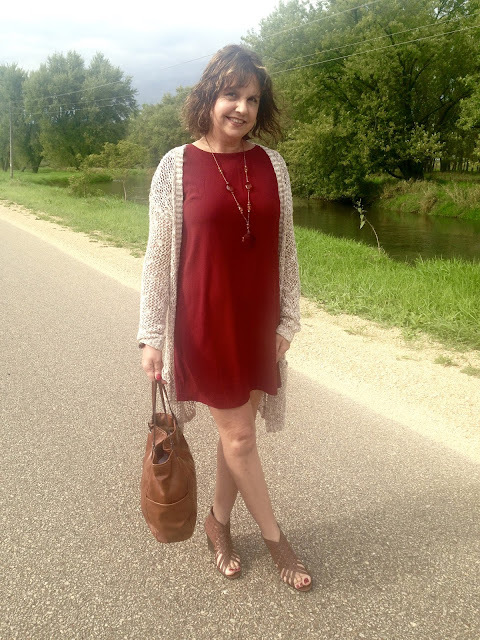 I previously styled it for spring HERE, but the dress is meant for fall, so I was excited to style it for the fall season this week. I styled it for fall by adding the sweater and all brown accessories. I know I've been showing you these same pair of booties for weeks now, but until the snow flies or the weather gets colder, this is the shoe for me! They look fall, yet because of the open weave design, they are more comfortable to wear in these warmer temps than the traditional closed bootie. For jewelry, I chose a brown glass bead long necklace and a brown beaded bracelet. My brown tote is from JCP and is starting to get a little worn as you can tell by the handle, so I will have to keep a lookout for a replacement soon. I kept the brown accessory theme going by wearing glass brown bead drop earrings. I was in the grocery store shopping when a complete stranger said to me "You look nice today!" I thought that was so sweet to receive such a nice compliment from a stranger. I tell people I don't know that I like their outfit or an item in their outfit all the time, but it's nice to get compliments in return too. And if hats aren't your thing, here is what the outfit looks like without the hat. So what about you? If you share your style on social media, what are your motives? I'd love to hear from you! Gorgeous gorgeous outfit! You look fabulous. The dress is perfect on you and you have styled it to perfection! Thanks Rachel! I take that as a real compliment coming from such a stylist as you! Maybe it's the age, Amy! Because I feel the same way. I don't always want to have women buy new things (although I think a modern purchase here & there can be helpful)! Finding items in our existing closets is realistic and styling them in different ways is fun! I love that you put on a dress for a day of lunch & shopping!! You look great! I keep meaning to ask you---is there a way to get your post sent to my mailbox? I'm not sure if I'm being blind, or just don't know where to look? Thanks Jodie. I do buy a few new things at the start of every season, and then I like to hit the clearance racks at the end of the season, so I do my fair share of buying new clothes. However, I don't run out and buy something new to wear for every blog post, which seems to be the norm for a lot of fashion bloggers. Oh, and I dress up for lunch and shopping because I don't work outside the home so when else would I ever have an occasion to dress up? As for email subscription, I'll work on that. I use to have an email subscription box but when I changed my blog template it was no longer compatible so it was removed. I've checked into how to trick the system to add it, but it seems very complicated. So I can't promise anything, but I'll try. You look beautiful in red Amy! Isn't it the best when you get a compliment from a total stranger?! I feel the same way, I don't think we have to run out and spend money on all the latest trends. I feel like the idea is to get inspired by others and shop your closet first before running out spending money. Thanks Jackie, yes the compliment really made my day. Such a pretty dress! The color and cut looks great on you! How nice that the women comment that you looked nice! It's a good reminder to tell people when we like what they wear and how they look! Thanks Andrea, yes, I always have a "list" of new trends or items I am looking for too. This outfit is so cute! And I absolutely love the red dress on you! Thanks for sharing at the Grace + Lace Linkup! Thanks Mackenzie! Shift dresses are one of my favs. So comfy. Keep on sharin' that style lady! Your dress is simply gorgeous! What a perfect color to wear this time of the year! Beautiful outfit! Thanks Elli! 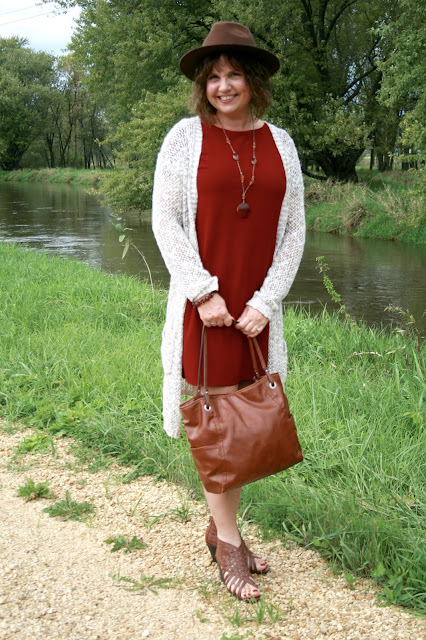 Yes, it's the perfect fall dress because the color is a fall color but it has short sleeves for the warmer temps. I definitely draw upon the inspiration from other blogs based around stuff I already have in my closet. Cute dress! Look at you all sassy in your hat! Great outfit. I feel the same way. It seems style blogs used to be where women shared there outfits with other like minded women. But it has become such a huge industry. I definitely prefer blogs where women share their style as opposed to their new clothes. Thanks Karen, you and I think so much alike on this issue. Such a cute outfit! I love seeing inspiration from other fashion bloggers! I can't imagine buying brand new clothes every weekend to post! Thanks Ruth, me too. And yes, I always wonder how they can afford new clothes so often too. I love reading blogs because they inspire me to remix my wardrobe and feel good about what I am wearing. I rarely make exact purchases I see on blogs, instead I look to my closet to find something similar to help me recreate a look. I will admit though, there are certainly times I get money from affiliate links (very little though, only a few dollars a month). I just use it to reinvest in my blog. Love that pretty cardigan! I can see why you got a compliment when you wore this outfit! Thanks Laura, thats why I read fashion blogs too. I use to do affiliate links as well, but I just removed most of them (still working on the older posts), because Google was giving me a hard time about them (they wanted me to either remove them or add a no follow attribute). I may or may not add them back in someday. I wear a lot of stuff in my closet for several years! I just don't have enough money to buy a new outfit for every day or even week! I love my lived in clothes and they're comfortable and me! I do try to add links to items that are new or newer, but in no way do I make a lot of money that way. 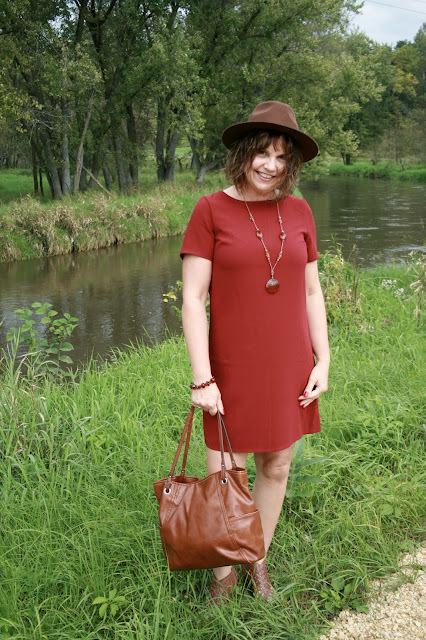 I really love the fall color of this dress and that hat is gorgeous with it! I need to wear hats more. Thanks Carrie, I feel and do the same. Cute outfit! Love that dress, Amy! It's true that many of the bigger fashion bloggers are all about having the newest things to style, and having affiliate links is probably a huge source of their income, so I can see why that blogger might have felt apologetic if their readers go to their blog as a way of seeing and shopping the latest trends. However, personal style shouldn't mean only what is brand new, and I appreciate things being styled and remixed and showing that it isn't always about the latest trend. Yes, absolutely! And I would have provided a link had the dress been new; I was just venting that we don't need to wear brand new clothes for every post to be a legit fashion blogger. And I do know that there are professional bloggers who blog for $ and not as a hobby like I do and I completely "get" why they always wear new clothes. Although, at the same time, I have personal and spiritual issues with the quest for always 'wanting something more" and materialism in general and promoting that philosophy on a blog, but that is another issue entirely for a future blog post. Also, I don't believe the blogger I referred to in my post is a "bigger fashion blogger", that's why I was surprised why she fretted so much about not having a link. Thanks for your comment and opinion. I appreciate it! Such a nice fall colors. Thank you to share this post with My Red Carpet. Amy, I love this color so much! That is what the blog is supposed to be, something just for enjoyment and sharing our love of fashion, So glad you do. I love the rust color and how you accentuated it with tan accessories. You look great! Thanks Jessica! It's a great color for fall, and I couldn't agree with you more about blogging. I have a limited shopping budget and keep most of the pieces in my closet year after year. I read blogs for inspiration and hope that my blog inspires others to create outfits with pieces they already have too! I love the color of your dress paired with the brown accessories! 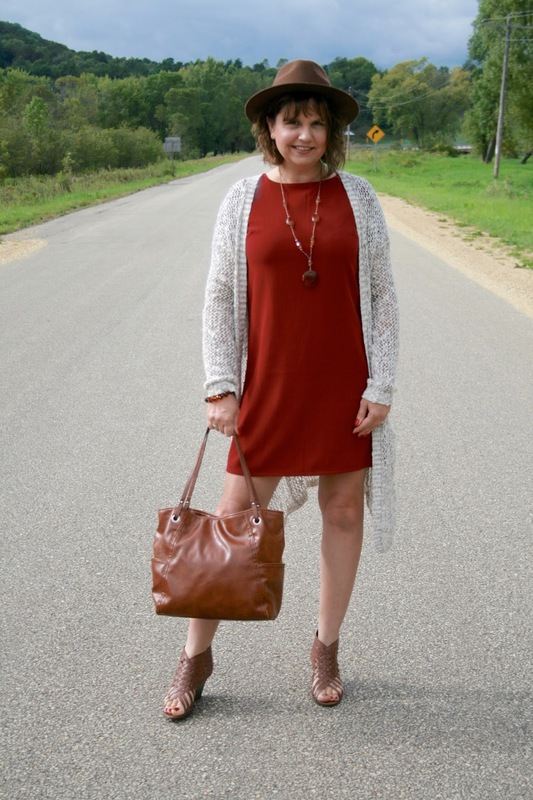 Perfect fall look! So glad to have found your blog. Words of wisdom. How many clothes do we need? I have more than my fair share, for sure. And I ponder all the time why I should even post anything I wear ever. I think my purpose for doing an occasional fashion/style (terms used loosely)is to just say at 58 I am still trying. And hoping to encourage other grandmas to do the same. Thanks Leslie! I agree, most seasons I don't even wear everything I own for that season before the season is over. I'm trying not to buy new clothes so often, as my closet is so over-stuffed. But I have a hard time resisting coupons and great deals! I think you should continue to post what you wear...we need more women our age showing our style!